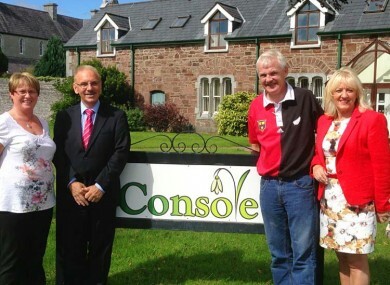 Members of Console with Donal Walsh's parents, Elma and Finbarr. DONAL WALSH’S PARENTS, Elma and Finbarr have donated funds to Ireland’s first suicide resource centre so they can refurbish two rooms. The Console Centre in Tralee, which recently opened at Balloonagh, said the rooms will be in memory of Donal and will be “dedicated to furthering Donal’s message to young people not to take their own lives”. Teenager Donal Walsh who died from terminal cancer in May of this year inspired many when he wrote an article on the issue of teen suicide. He went on RTE’s The Saturday Night Show and called on teens not to take their own lives. “His work will continue in this wonderful collaboration between Console and his parents,” said Paul Kelly, CEO of the national suicide prevention and bereavement charity Console. We are creating Donal’s Rooms where young people in difficulty can get immediate professional help, counselling and support. Donal’s message that life is worth living really had an impact because he spoke from the heart. The Walsh family recently set up the Donal Walsh #Livelife Foundation and Donal’s mother, Elma, thanked the community for their contributions to the fund. “We are delighted that Donal’s two main messages, the need for suicide prevention and teen care facilities, are now coming together under one roof at Console’s Tralee centre,” said Elma Walsh. She said it is important to create a comfortable space where young people feel safe and “amongst their own”. Donal speaking out in the way he did has made a huge difference. I usually deal with 18 suicides a year, about 1 and a half a month on average. But since Donal spoke out against suicide, I have had no suicides from March to August. The Donal’s Room’s refurbishment presentation to Console will take place at The Donal Walsh LiveLife Gala Ball in the INEC Killarney on Friday 27 September. Email “Suicide resource centre dedicates rooms to Donal Walsh”. Feedback on “Suicide resource centre dedicates rooms to Donal Walsh”.